The arthropod predators of insects and mites include beetles, true bugs, lacewings, flies, midges, spiders, wasps, and predatory mites. Insect predators can be found throughout plants, including the parts below ground, as well as in nearby shrubs and trees. Some predators are specialized in their choice of prey, others are generalists. Some are extremely useful natural enemies of insect pests. 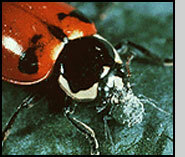 Unfortunately, some prey on other beneficial insects as well as pests. Insect predators can be found in almost all agricultural and natural habitats. Each group may have a different life cycle and habits. Although the life history of some common predators is well studied, information on the biology and relative importance of many predatory species is lacking. In this document, we have included the more common and better understood beneficial predators. Most beneficial predators will consume many pest insects during their development, but some predators are more effective at controlling pests than others. 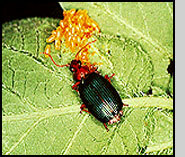 Some species may play an important role in the suppression of some pests. Others may provide good late season control, but appear too late to suppress the early season pest population. 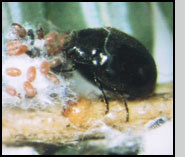 Many beneficial species may have only a minor impact by themselves but contribute to overall pest mortality. Often too, the role of the beneficial predators has not been adequately studied. Surveys of agricultural systems give an indication of the potential number and diversity of predators in a crop. For example, over 600 species of predators in 45 families of insects and 23 families of spiders and mites have been recorded in Arkansas cotton. Eighteen species of predatory insects (not including spiders and mites) have been found in potatoes in the northeastern United States. There may be thousands of predators per acre, in addition to many parasitoids. Although the impact of any one species of natural enemy may be minor, the combined impact of predators, parasitoids, and insect pathogens can be considerable.